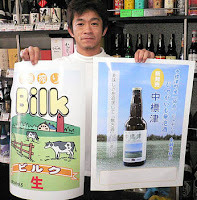 A brewery in Hokkaido, Japan has succeeded in producing a low-malt beer using milk. The idea, which came from the son of a liquor store manager, was suggested to help use up surplus milk produced by local farmers in Nakashibetsu. Called “Bilk” (Beer+Milk), the new drink reportedly has a fruity flavour, which the brewers hope will make it popular among women. Each 330ml bottle costs 380 yen (or approximately US$3.25/S$4.95) and availability is restricted to Nakashibetsu for the time being. A good thing, considering how expensive this stuff is.